Based on the story by H.C. Andersen, The Snow Queen is a ballet for the whole family, a huge hit and critical success that has sold out every performance including extra ones in the past three years. The production has also been screened in cinemas and broadcast on TV. Now, this smash hit returns to the FNB! 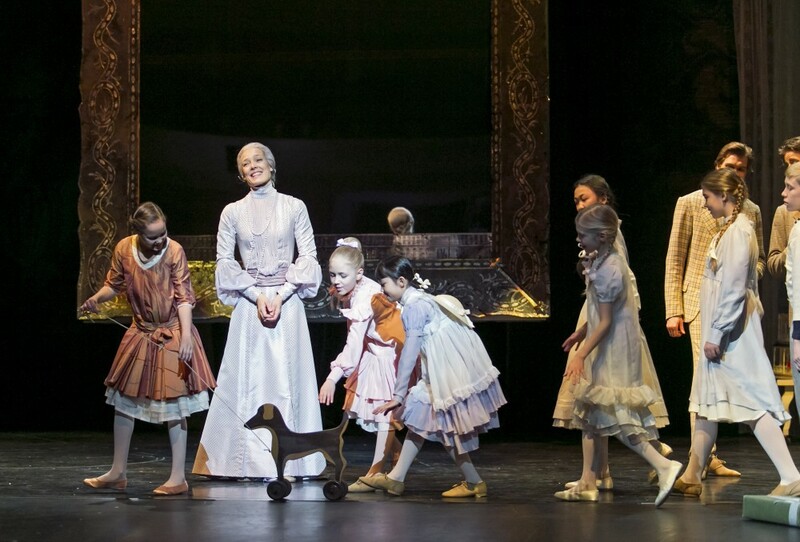 The ballet is suitable for the whole family but recommended for children over the age of 6, as there are some scenes that may frighten very small children. The Snow Queen recounts the magical adventures of two children living in Helsinki a century ago, Kai and Kerttu. The story shows how much courage they need to cope with what life throws at them. Kerttu’s grandmother has bought a beautiful old mirror at a market on a trip to Lapland without knowing that it houses the magical power of the Snow Queen. The story features the adventures of two children, Kai and Kerttu, in Helsinki over 100 years ago. It is Kerttu’s birthday. Kai has made her a present himself, a glowing, snowy glass globe. When the two friends are together, the globe begins to glow. Kerttu understands that what Kai has given her is much more than just a gift. Suddenly, the children’s life is changed. This change is precipitated by a mirror that their grandmother has bought on a trip to Lapland. The mirror is a magical mirror, stolen from the ice castle of the Snow Queen in the farthest North. The Snow Queen, enraged at the theft, has sent her gnomes to find the mirror and retrieve it. When they finally find the mirror at Kerttu’s home, they drop it in their haste, and it shatters into thousands of pieces – each carrying a bit of the freezing cold magic of the Snow Queen. One of the shards flies into the eye of Kai as he sleeps, changing the way he sees the world around him. Another shard flies into the glass globe, extinguishing its glow. A third shard is found by a Lapland witch or seita, the half-sister of the Snow Queen. Desiring to recover all the pieces, the Snow Queen decides to kidnap Kai and have him reassemble the mirror at her ice castle. Kerttu embarks on a long journey to find Kai at the ends of the world. She meets many different people on her travels. Finally, she ends up in the farthest North and talks to the Lapland seita. The seita and her horde of children invite Kerttu to meet the denizens of an underground world. Kerttu is able to conquer her fear of these strange creatures, as in her travels she has learned to understand different creatures. Kerttu discovers that everyone fears the Snow Queen, and they all combine forces to rescue Kai from the frozen castle. A full synopsis and background information are available in the programme booklet. In the centenary year of Finland, the Finnish National Ballet visited Copenhagen in Denmark, the home country of author Hans Christian Andersen and choreographer Kenneth Greve. Greve’s much-beloved ballet had four sell-out performances at the Royal Danish Opera in January 2017, one of which was attended by Queen Margrethe. The Snow Queen is the theme of First Taste of Opera & Ballet and Opera & Ballet in Action workshops in autumn 2019. The First Taste of Opera & Ballet will wake up all the senses of both babies and their parents by singing, playing, moving, listening, looking and touching – no previous experience necessary! In Opera & Ballet in Action workshops 5 to 6 years olds will experience the fascinating world of opera and ballet by playing instruments, dancing, and making art and crafts. The LED screen used in the production was created by RGB Oy. You can buy individual tickets for season 2019–2020 performances in our online store at a 10% discount until 15 June. This discount only applies to normal priced tickets (not the H price category) to Main Stage performances. The discount is not given for tickets to visiting productions. Refreshment sales will start later in April.